Color, 1994, 125 mins. 18 secs. The strange renaissance of classic movie monsters that overtook Columbia Pictures in the early '90s may have only lasted for three films, but it was fun while it lasted. 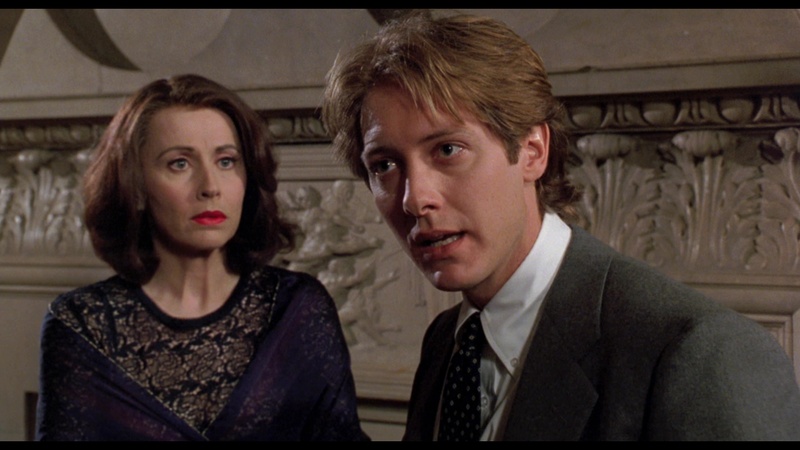 In the wake of Francis Ford Coppola's daffy Bram Stoker's Dracula in 1992, moviegoers were slammed with no less than two Columbia monster offerings in 1994: an even more overripe adaptation with Kenneth Branagh's take on Mary Shelley's Frankenstein in time for Thanksgiving, and earlier that summer, the only modern variation of the trio: Wolf. 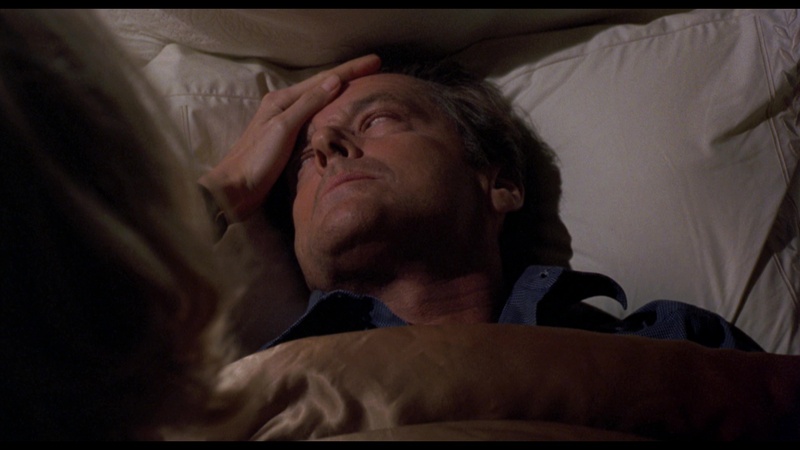 Pulling tropes from the Universal werewolf films and spinning them into a wild male middle age crisis revenge fantasy, this marked the fourth and final collaboration between writer-director Mike Nichols and leading man Jack Nicholson, following Carnal Knowledge, The Fortune, and Heartburn. 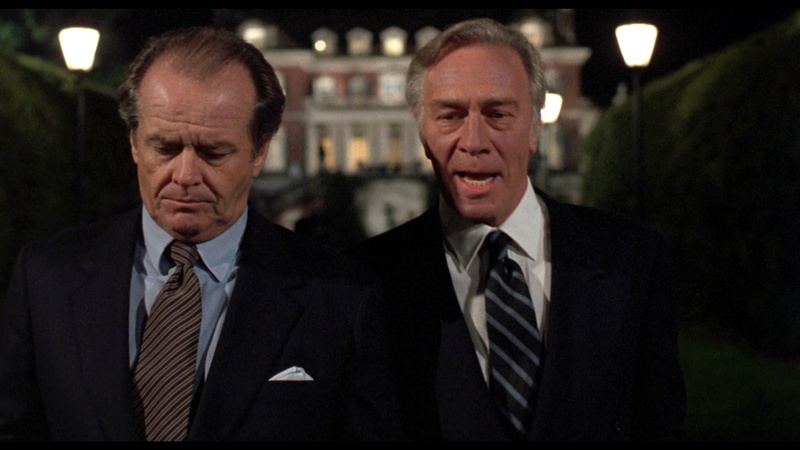 Oddly enough, Wolf could easily play as a clawed, furry extension of where Carnal Knowledge left off, with an aging, rakish Nicholson finding a way to get his mojo back at work and in love courtesy of a supernatural twist of fate. 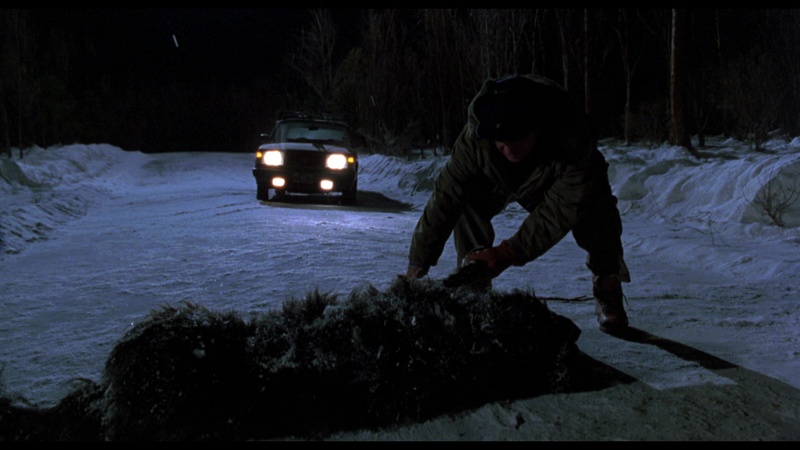 That twist comes in the form of a wolf struck late one snowy night by a car driven by Will Randall (Nicholson), a seasoned New York editor. After being bitten by the dying animal, Will spies a pack of them watching from the woods-- and of course, soon he finds himself altering in unexpected and furry ways. Those changes coincide with some major turns in his everyday day, such as the takeover of his publishing house by the rich Raymond Alden (Plummer), the disintegration of his marriage to unfaithful Charlotte (Nelligan), and the demotion he faces due to his backstabbing protégé, Stewart (Spader, doing one of the liveliest of his many smarmy yuppie roles of the period). Then there's Laura (Pfeiffer), Alden's rebellious daughter, who takes a shine to Will and provides his alibi when violent animal attacks start turning up around the city. Could Will be responsible, or is there something even more monstrous lurking nearby? Beautifully shot by regular Fellini cinematographer Giuseppe Rotunno (who also lensed Carnal Knowledge) and given a dreamy sheen by the unusual score by Ennio Morricone (who would reunite with Rotunno soon after for The Stendhal Syndrome), Wolf is a much more eccentric offering than most moviegoers were expecting at the time. The promise of Rick Baker werewolf effects set up expectations of a normal werewolf on the loose film (which he provided in An American Werewolf in London and the 2010 over-CGI'd Universal redo of The Wolfman), but instead the wolf action is mainly comprised of a few furry face and yellow contact effects until the obligatory but fairly brief wolfed-out climax. 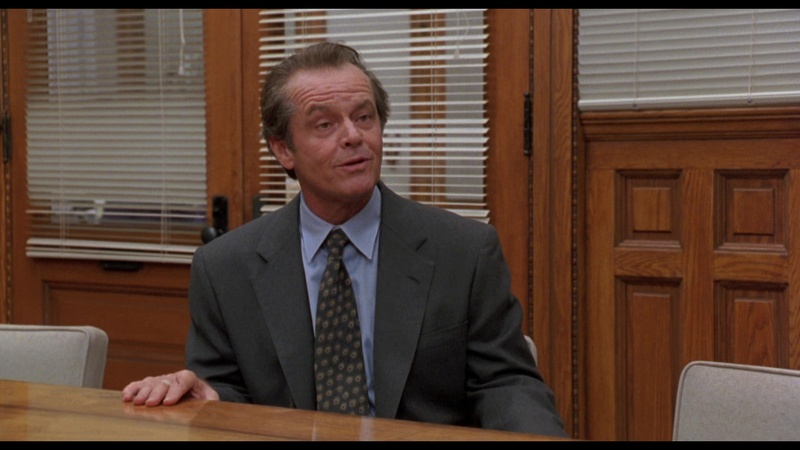 Nichols and company seem far more interested in playing around with the idea of how a werewolf bite can reinvigorate a man viewed by everyone around him as past his prime, and it's here that Nicholson really shines as his character learns how to push back and mark his territory (quite literally in the film's funniest scene in a men's bathroom). It's a mature take on monster lore that major studios probably wouldn't be interested in bankrolling today, and despite the R rating (which is due more to a sprinkling of curse words than anything else), it's a horror movie you could probably show to just about any family member without getting into much trouble. Of course, it's also worth seeing just for the always radiant and talented Pfeiffer (back with Nicholson again after The Witches of Eastwick), who was on a real hot streak at the time and deservedly gets to close the film out with an unexpectedly poetic conclusion. 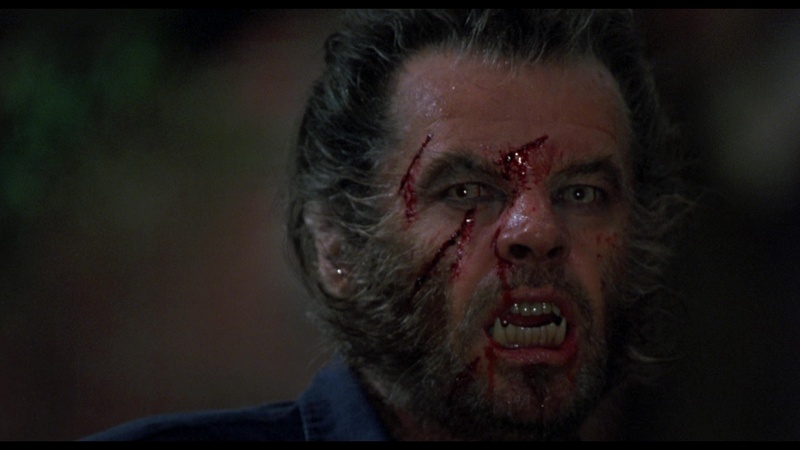 Consistently available on home video since its initial days on VHS and an incredibly ugly, yellow-tinted laserdisc edition, Wolf has usually been given short shrift in the special features department with its 1997 worldwide DVD release and 2009 Blu-ray upgrades offering zilch for extras. Fortunately the 2017 region-free Blu-ray from Indicator corrects that oversight with a greatly expanded edition that provides the first real respectable release of this film in any format. The film itself features the same excellent Sony-provided HD transfer found on the prior American Blu-ray, which still looks very solid with a faithful replication of Rotunno's burnished visual scheme. English LPCM stereo and DTS-HD MA 5.1 audio options are provided (with optional English SDH subtitles); the former sounds closer to the theatrical mix and gives a bit more heft to the Morricone score, while the latter is more spacious and shows off your sound system a bit more. In short, both are worthwhile but a bit different. Fiction Factory's "The Beast Inside: Creating Wolf" (55m14s) brings together Baker, screenwriter Wesley Strick, and producer Douglas Wick for a solid dissection of how the film came about with the intention to do something different from a traditional horror film (which they achieved, for better or worse depending on what you expect). A batch of EPK interviews from the film's production follow next with Nichols (8m39s), Pfeiffer (51s), Spader (2m3s), Nelligan (1m43s), Wick (3m3s), writer Jim Harrison (2m53s), Baker (1m34s), and production designer Bo Welch (2m4s); all are brief and fairly fluffy, but it's fun to see these rarities preserved for posterity. Also presumably compiled for an EPK is a batch of b-roll production footage (4m8s) showing Nicholas and crew at work, followed by the theatrical trailer and a batch of production and promotional photos. The limited edition (3,000 units) first pressing also features an insert booklet with a new Brad Stevens essay and a sampling of reviews and press coverage from the film's release. Reviewed on November 26, 2017.